Louis A. (Bud) Moore Jr. Bud was born in Phoenix, Arizona and has lived here all of his life, with the exception of his time in the Marine Corps. Bud graduated from Brophy College Prep School in 1960. 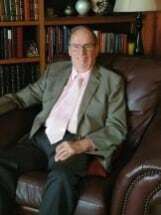 He earned his Associate Degree from Phoenix College, and his Bachelor’s Degree at the University of Arizona in 1965 (where he belonged to Alpha Tau Omega Fraternity). Bud earned his Juris Doctorate in 1968 from the University of Arizona. In 1968 Bud enlisted in the United States Marine Corps and went to Officer Candidate School. He was commissioned as a second lieutenant in January, 1969, and in 1970 he became a captain in the Marine Corps. During his years in the Marine Corps, Bud was a criminal defense attorney, a confinement commissioner, and a military judge. He was stationed in Quantico, Virginia; Newport, Rhode Island; Camp Pendleton, California; Okinawa, Japan; and Vietnam (DMZ). Upon his discharge from the Marine Corps, Bud worked for the Arizona Attorney General’s Office in 1972, where he was doing appellate work before the Supreme Court of Arizona. From there he went to work for the Arizona Organized Crime Bureau with the Department of Public Safety and the Arizona State Attorney General’s Office. In 1973 Bud went into private practice, and has been practicing on his own since that time. His office is now located in Sun City, Arizona. He was on the Board of Directors of the Maricopa County Mental Health Association, a past member of the Deer Valley Kiwanis, and he currently belongs to the West Maricopa Valley Bar Association and the State Bar of Arizona. Bud’s practice areas include criminal defense, family law, and domestic relations. In addition to being admitted to the Arizona State Bar, he has also been admitted to the U.S. Supreme Court. Bud has served and is presently serving as a Pro Tem Magistrate Judge.